Jared's dream of becoming a mechanical engineer seemed unreachable – until he found out about the ASPIRE program. When Jared Pitts was just one year shy of finishing his mechanical engineering degree, he was forced to drop out of college because it was too expensive. Jared’s dream of becoming a mechanical engineer seemed unreachable – until he found out about the ASPIRE program. ASPIRE is our new workforce initiative aimed at connecting hardworking people, like Jared, to better jobs and living wages. 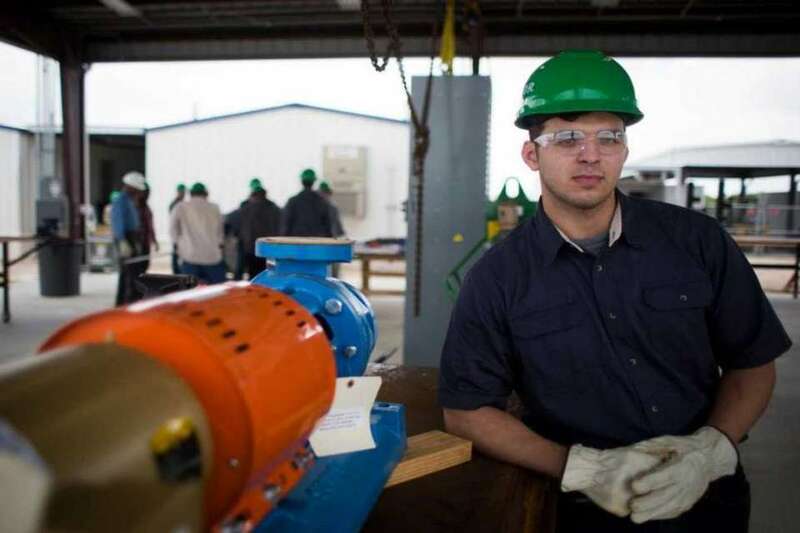 The action plan for ASPIRE is to partner with employers in Houston’s growing industries to identify middle-skill job opportunities, and connect with committed workers who are ready to acquire the skills needed to obtain these jobs. We connected Jared to the Fluor training program for pipefitting. He attends class 40 hours a week, and continues working his full time job. After he completes the three-month program and receives his certification, Jared plans to work at a nearby plant making $35 an hour. BakerRipley has brought together Workforce Solutions and JPMorgan Chase as key partners to its newest program, ASPIRE. This initiative will create a pathway to build a quality workforce and address the region’s dramatic and growing need for skilled workers. Through ASPIRE, BakerRipley will move 1,000 underemployed individuals from low-wage jobs to living-wage middle-skills jobs. JPMorgan Chase has invested $1 million as part of its global New Skills at Work initiative to support ASPIRE and address the mismatch between employers’ needs and the skills of job seekers. The key to ASPIRE’s success lies in its foundation of collaborative partners and supporters that stand with BakerRipley – Rockwell Fund, UpSkill Houston led by the Greater Houston Partnership, the United Way THRIVE, Houston Community College (HCC), San Jacinto College, Lone Star College and other community and employer partners. This region will move forward because organizations and leaders from different sectors, especially the business community, are all stepping up together to align the right resources for both skilled workers and employers. To help other people like Jared, click here.